A video introducing President Obama at the Democratic National Convention Wednesday noted that Mayor Emanuel advised Obama to abandon the Affordable Care Act during his time as the president’s chief of staff. A video introducing President Barack Obama at the Democratic National Convention Wednesday noted that Mayor Rahm Emanuel advised Obama to abandon the Affordable Care Act during his time as the president’s chief of staff. “A lot of people argued the politics were too costly,” the video’s narrator said as a photo of Emanuel and Obama talking in the Oval Office was shown. Emanuel served as Obama’s chief of staff during part of his first term, before leaving to run for mayor in Chicago. “Rahm Emanuel came to him and said, ‘You’re going to have to pull the bill, because if you push this legislation, you will lose in 2012,’” the narrator added as more pictures of Emanuel and Obama flashed on the screen. Commenters responded swiftly on social media, claiming Emanuel was thrown under the bus in the video. 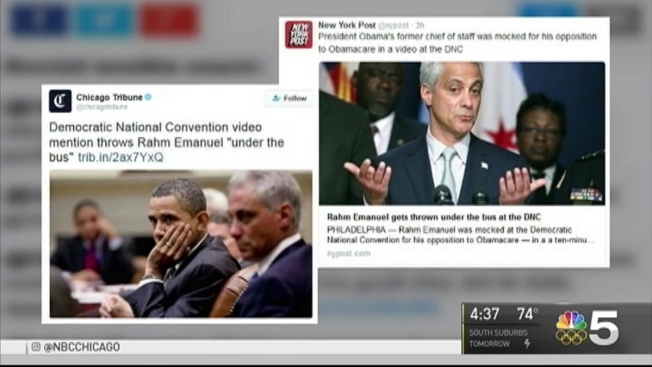 “This video totally throws Rahm Emanuel under the bus on Obamacare,” the Washington Post’s Chris Cilliza tweeted. “Rahm portrayed as the cowardly calculating hack in this video,” MSNBC’s Christopher Hayes tweeted. Emanuel, who has been persona non grata on the presidential campaign trail, came under fire in the wake of the Laquan McDonald controversy. McDonald was shot and killed in October of 2014 by Chicago Police Officer Jason Van Dyke. After dash-cam footage of the incident was released last November, there was a large public outcry for the mayor’s resignation, the Chicago Tribune reported at the time. After skipping the convention’s first two days, Emanuel reportedly hosted a “Chicago Rockin’ Blues” party Wednesday night in Philadelphia, featuring performances by the Preservation Hall Jazz Band and Blues Traveler.